To appreciate and encourage scientific endeavours of young minds Thapar Institute of Engineering & Technology (TIET), Patiala celebrated SCI FEST 2019 on February 21, 2019. School of Physics and Materials Science, School of Mathematics, School of Energy and Environment; and School of Chemistry and Biochemistry came together to helm the organisation of this event. Eminent scientist Dr R. K. Sharma, former Director, Solid State Physics Lab (DRDO), New Delhi graced the occasion as the Chief Guest and Prof. Prakash Gopalan, Director, TIET presided over the function. Dr R. K. Sharma with his long career spent in forefront of scientific and technological innovations for the country was able to familiarise the students with the different career choices available in science. He encouraged the students to work towards the betterment of the society. 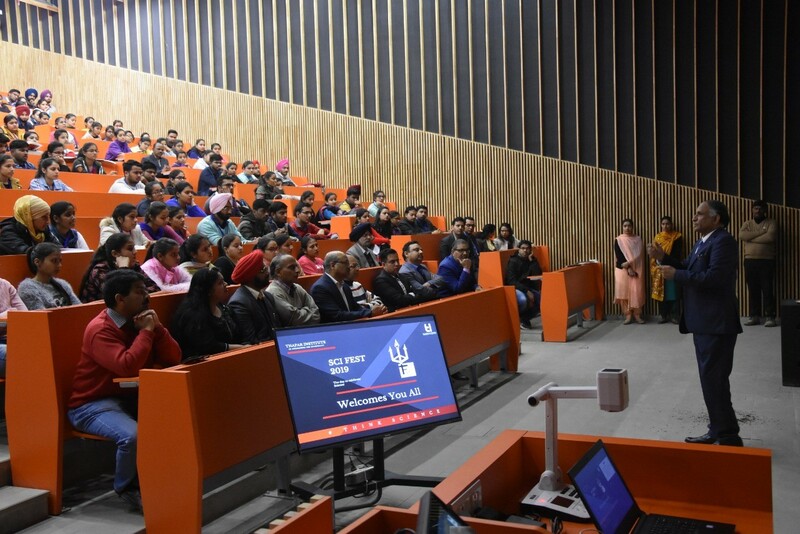 More than 300 undergraduate science students from various institutions and colleges of Punjab, Haryana and Chandigarh enthusiastically participated in SCI FEST 2019. Apart from the motivational lecture different competitions, such as, Poster Presentation, Scientific Quiz, Project Demonstration and Scientific Rangoli were organized as part of this event. The themes for the Poster presentation and Scientific Rangoli were "Work of eminent scientists highlighting their applications" and "Scientific Innovation". Innovative applications of fundamental scientific concepts were clearly visible in Poster Presentation and Project Demonstration events. Creativity of the students in blending the concepts of science into spell binding visual creations was evidenced during the Scientific Rangoli competition. Quiz consisting of multiple rounds was keenly fought out to the end among 14 teams. Thapar Mathematical Society (TMS) organised a lecture series on Partial Differential equations and its applications on March 29-30, 2019. The two-day lecture series gave a detailed insight of partial differential equations from elementary to research level and will help accustomed with its real-life applications. Speakers were Dr. Jitender Singh (GNDU, Amristar) & Dr. Dilbag Singh (PU, Chd). Two M.Sc, 2nd year students, Vandhna and Medha, won the first prize for their model “Rubik’s Cube, an application of modern Algebra” at the National level Exhibition "Mathematics at Work" organized by Sanatan Dharam College (Lahore), Ambala Cantt (Haryana) on October 23, 2018. Rajenki Das (MSc 2nd year) and Soham Banerjee (BE-ELE, 2nd year) had won the regional round of Tata Crucible held at IISER Mohali. The team subsequently participated in the North Zone round held at The Taj, Delhi and came as runners-up. Madhu Aneja, PhD student in SOM presented a research paper in 19th international conference on “Computing Science & Mathematics" held in Melbourne, Australia on 29-30 Nov, 2017. This visit was sponsored by TIET, Patiala. Tarun kumar, PhD student participated in a poster presentation at the University of Alberta, Canada. Komal Singla, Research Associate in SOM presented a research paper in International conference of Mathematician held at Rio de Janerio, Brazil.